Jade-glaze, also known as Turkish blue glaze, peacock green glaze, or peacock glaze, is a low temperature glaze of a sky blue color with great transparency that was developed in western Asia using a copper colorant. It is most often used in combination with white slip and underglaze iron decoration on Cizhou ware vessels. This jar featuring a short neck was coated with a white slip, decorated on the shoulder with a band of scrolling foliage and on the body with window panels enclosing a dragon and a phoenix in underglaze iron, and covered with a jade glaze. 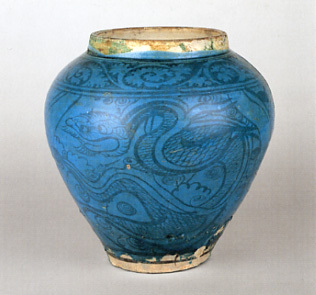 The black motifs of the dragon with its long winding body and the phoenix with its outstretched wings show through the blue glaze, making this jar a most impressive piece.